This exhibition will seek to showcase artworks by local feminist artists, as well as works which highlight feminist issues. 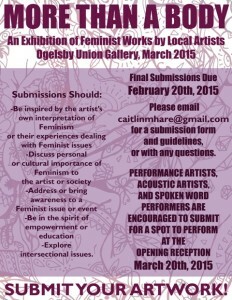 The exhibition will take place March 2015 on FSU’s campus, in the Ogelsby Union Gallery, with a reception March 20th. The show welcomes all artists, and Performers, Singers, Spoken Word Poets are also encouraged to submit work for the reception. 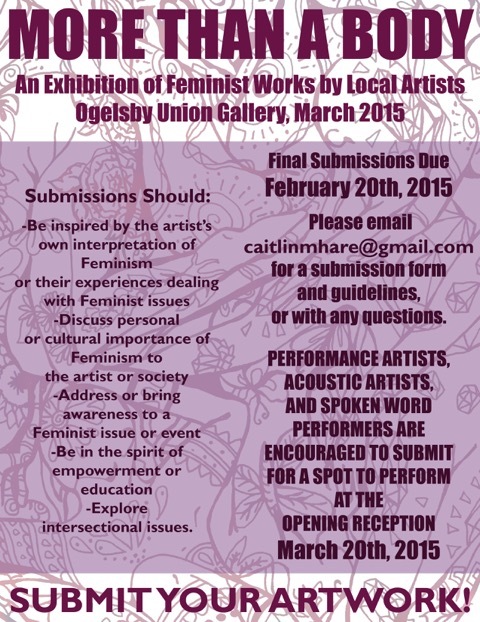 Submissions are due FEBRUARY 20th, 2015 to caitlinmhare@gmail.com. Digital images should be at least 300 dpi and submitted as .jpg’s or .png’s. Film pieces may be submitted as videos, but please include at least two screenshots. For sculptural pieces, please include at least two photographs per object. If you are submitting a performance for the Reception, please email with a summary of your planned set and an estimated performance length.